The Grand Boucle has kicked off once again and for the first time in its 100 race history it started in Corsica. I prepared myself for the 3 weeks of insomnia that us antipodeans have to endure to enjoy the race (and the Formula 1 season, and the European Football season…). I even got my lounge chair set up to watch the ride. If only I could move it into the centre of the lounge room as the left hand side of the peloton always looks like it is about to break away. Winter has hit Sydney wet and hard and I need to be fit and healthy going into September for a couple of big rides, no point risking pneumonia. 23 days of Le Tour on a turbo trainer plus rides outside on my other steed (outfitted with slicks) will be my base. 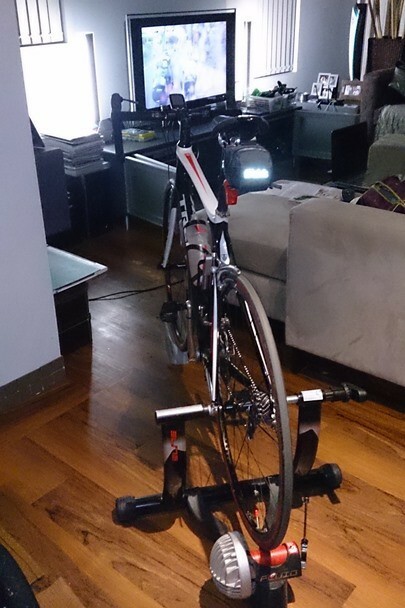 On a side note, I will be using the trainer to focus on getting my technique sorted – focusing on cadence, position on the bike, pushing intervals, and flexibility on the drops. It is tough going on the turbo trainer as there is no free-spinning and you sweat like a pig, just constant spinning at pace. Last night I logged 1hr 20min at 90RPM – torture. Anyways back to Le Tour and my amateur assessment of last night’s stage. With the route as flat as an ironing board this was always going to be a sprinter’s stage. A couple of futile breakaways tried to get some sponsorship advertising time ahead of a peloton who really couldn’t give two hoots knowing that these guys were showboating. The first half had only a few teams pulling the weight, with Cav’s Omega Pharma-Quickstep team doing the majority of the pulling aided by Gorilla Griepel’s Lotto-Belisol and Kittel’s Argos Shimano. Surprisingly the Tourminator’s (Sagan) Cannondale team were nowhere to be seen. As for Orica-GreenEdge, if they have aspirations for points or a stage they need to be bringing Matt Goss up with a bit more organisation. But when it came to the intermediate sprint, it was all Gorilla! He left Cav in his dust and Sagan struggling. It is going to be interesting to see how the Maillot Vert competition to play out, but we were to be later robbed of the first true test. Sagan looked like he was about to play a game of American football with black marks under his sunglasses to no doubt stop errant laser beams or an electro-magnetic pulse. El Pistolero’s (Contador) Saxo-Tinkoff team were given a rocket not long after and it sent jitters through the peloton. BMC and Sky both responded in kind and then the Jensie marshaled his Radioshack-Leopard Tank team up the front as well. They started belting it out at over 55km/hr and the Jensie had the mind to try and calm everyone down. The peloton stretched out to over 400m which left the newbies scratching their heads thinking “we have 3 weeks of this?” So they dropped a gear or two back down, but by this stage the whole peloton had hit what was a very narrow stretch of road. Cannondale decided that they needed to jump to the front of the group and a couple of them cut across via the non-trafficable part of the road and in front of the peloton – and Jensie. Careful boys, you may have the Tourminator in your team but the Jensie may just go out and kill you – show some respect! First it was Johnny “pain” Hoogerland was the first to go down into the side barriers – which he probably found better than barbed wire, but not ideal. Then it was the turn of Hesjedal and Kessiakoff to show their inexperience with both going down and it was not pretty. Hesjedal might have one Grand Tour title, but his positioning left him wanting. But the real drama was one that did not involve the riders at all. Tony Martin also joined the asphalt dance which will leave him wondering, haven’t I done this dance before? Orica GreenEdge may think that any publicity is good publicity, but wedging your bus under the finish banner is not good publicity. Why they need the tallest bus in the whole tour begs belief, and it could be the focus of the team mechanics overnight to work out how to lop a couple of feet off the top of the vehicle. This caused pandemonium for the race organisers who did not have cranes or similar heavy machinery anywhere near the finish line. Jonathan Vaughters aptly tweeted “Boy, I wouldn’t want to be the Greenedge bus driver…” So the organisers were trying to work out where they were going to finish the race should the bus not be dislodged. Race radio broadcast to all the teams that the 3km to go point would be the mark where the speeding peloton would be measured. But this was a crazy position, as it was in the middle of a chicane. Don’t know what they were thinking. Apparently all the teams had been warned about the difficult road conditions on the route, but I am not sure how many were actually listening because more carnage ensued. The peloton had started ramping it up again when down went one of the riders from Cav’s Omega Pharma-Quickstep team. He promptly took down Cav and the Tourminator who was marking him closely. This crash also took down a host of others namely El Pistolero. The Tourminator went down hard, but he told his team mates about how his flesh was merely an out coating over his metal body and that he would be back. The Gorilla, Kittel, and Goss were licking their lips thinking to themselves there goes two troublesome ones. But then The Gorilla copped a mechanical, which should prove to the team that bulletproofing their bikes is better than focusing on the helmets. They finally managed to get the Orica GreenEdge team bus dislodged, and luckily for some of the day’s victims the race organisers informed the field that 3km from the 3km mark would be the point at which the stage timing would be taken. The group out front were left wondering – WTF? Evans and Froome-dog kept their noses clean and now it was really down to Argos-Shimano to deliver Kittel to the line. Only Matt Goss could really throw a spanner in the works, but on the final left hand turn towards the finishing straight he mis-judged his turning line and his pedal or bars clipped the side barrier taking himself down. Led out by his teammates, Kittel stormed past everyone taking a well deserved win and taking the first Maillot Jaune for this year and also jumping into the lead for the Maillot Vert. Evans and Froome-dog finished unscathed, but there will be a host of other riders putting on the Dettol (Australian antiseptic for those who don’t know and it stings like a muther….) after the race. It was pretty manic and the Jensie was probably right in trying to tell everybody to calm the hell down. This is going to be a long and painful tour, so if they all want to finish safely they better start riding a bit smarter than some of the shenanigans that were on display. Seeing the Corsican countryside gives me the urge to plan a week’s tour there sometime……. That’s what my wife said. Insomnia now over here in the Southern hemisphere and it is only day 3!